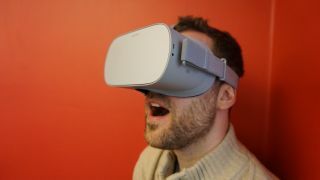 Oculus Go is officially getting second-screen support, confirmed Oculus VR Chief Technology Officer John Carmack via a Twitter exchange with an excited Oculus Go user. That means that you’ll be able to cast whatever you’re seeing in the VR headset to a TV, tablet, and even phone. So the people watching you flail around in a virtual world can actually see your assailants. Alongside making VR less of a solitary experience, second-screen support opens up the possibility of games that require collaboration between parties split between the virtual and real world like the incredible Keep Talking and Nobody Explodes where the VR participant is in a room with a bomb and the people in the real world have to talk them through deactivating it. How long is 'a little while'? Now, second-screen support is nothing new, as both the Gear VR and Google Daydream headsets already have the ability to stream to Chromecast devices. What’s interesting is the potential mobile applications that could accompany it. In his tweet, Carmack was replying to someone saying that they wish the Oculus app could stream “what you’re seeing in VR”. Carmack replies: “I made a demo of that, bit it will take a little while to get it integrated into the companion app”. While the Oculus Rift and HTC Vive have the ability to mirror gameplay on the computer running the game, they aren’t able to stream to a phone, and as current wire-free headsets use your phone, this is a new application of second-screen streaming. Whether or not this actually opens up any new avenues for how VR will work, it’s interesting to see that Oculus is still pushing boundaries, rather than just trying to produce a cheaper version of their flagship product.